1. Preheat the oven to 200ªC, gas mark 6. 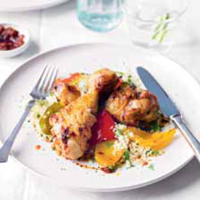 Score the chicken, coat with harissa and put on a baking tray with the peppers. Drizzle over the oil. Roast for 30 minutes until the chicken is cooked through with no pink meat and any juices run clear. 2. Meanwhile, put the couscous in a bowl, pour over the stock, cover and leave for 5 minutes. Fluff up the couscous, stir in the parsley and serve with the chicken and vegetables.